I made a tote bag gift bag. 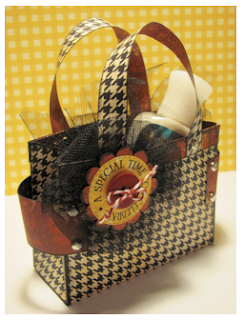 This little bag is the perfect size for a gift card, for a manicure, and a small bottle of lotion. I used the Cherry Truffle paper line, it was perfect for the look I wanted. I found the tutorial to make the tote bag here. The silver bards were purchased at Michael’s. 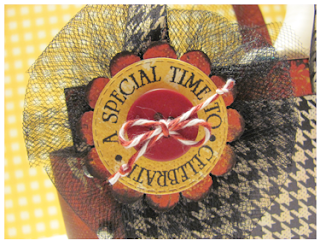 I used My Creative Time’s Scallop and Stitched Circle dies and the All Around Birthday stamps. I bought the 6” black tulle at Michael’s. Ruth Ann, this is amazing! 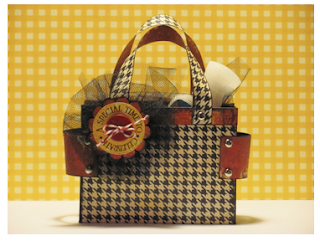 I LOVE the look of the hounds tooth for this project and it's beyond adorable!!! Way to knock it out of the park! I am so inspired to make a few of these to use for gifts!!! Thank you! wow!!! this is fabulous Ruth Ann. This is so creative, thanks for sharing it! I love that Tote in the picture, it would be hard to give up something that cute!